Ballymena United manager David Jeffrey was brutally honest after watching his side’s 4-0 Irish Cup defeat to Coleraine on Saturday. Two goals apiece from Eoin Bradley and Jamie McGonigle sealed the Bannsiders a semi-final spot and Jeffrey was honest about his side’s performance. “Didn’t help ourselves when our two centre backs went off. That knocked all our shape and our organisation. “The goals, every single one of them we played a part in and to be fair Coleraine did not have to work to hard to get their goals. “But on the day Coleraine were the better side - it’s as simple as that and we could not get into any kind of rhythm. But I have told the players that I am extemely proud of them and I am not going to criticise them in any way because some days you get results like that. “This is a rollarcoaster ride and people should not get carried away - because we are not getting carried away. “We have had lots of success this season already. “We have already won a major trophy this year and that has not been done here in over 28 years. “We have also claimed a top six place in the league for the first time in the club’s history - since the Premiership was set-up. “But don’t get me wrong. We wanted to progress very, very much but to be brutally honest it is the league we are focused. “Today would have been a bonus but it was Coleraine’s day today.” he added. And Jeffrey admitted he was gutted to have turned in that kind of performance when the stands at the Showgrounds were packed. “I am bitterly disappointed on a day when the place is sold-out that we let them down. “The supporters know the players have played out of their skins all season and it was a struggle when we lost our two centre backs. “Caolan Loughran wanted to stay on but he did not know where he was. 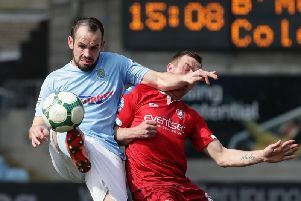 “But congratulations to Oran Kearney and William Murphy and well done to them and good luck to them in the next round. “And I have to say the fans of both clubs were brilliant in the 12th minute. “The Coleraine fans joined in and I thought was brilliant. “We play Portadown in the league next weekend and they had a poor result in the Irish Cup as well so they will come here looking to put that right.